With growing global concern over environmental degradability from greenhouse gas emissions, green data center market is set to occupy a pivotal stance in the expanding cloud computing space. Energy efficiency has become an important axiom in the realm of Green Cloud and current trends of cloud data center infrastructure is highly driven by it. Manufacturers across the world are putting rigorous efforts to establish data centers that ensure reduced power consumption, while maintaining the desired quality of service. It is subsequently coherent that with the robustly increasing volume of data, green data center industry is likely to depict an ascent, subject to rising pressure on business firms for efficient data management. 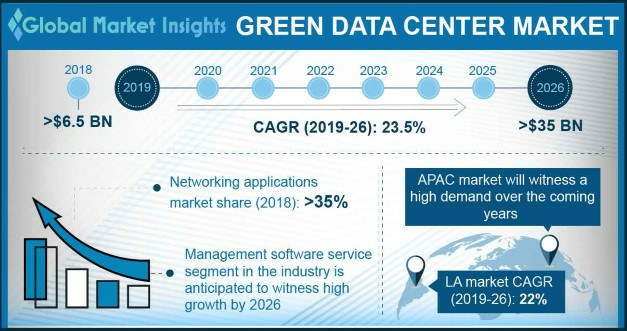 As per Global Market Insights, Inc., green data center market size is forecast to exceed a valuation of USD 25 billion by 2024, which is a marked development from its valuation of USD 5 billion in 2017. The primary rationale that acts behind this accelerated growth is the enormous energy consumption by the data centers and the subsequent increase in carbon footprint. Traditional data centers are highly energy intensive with typical power densities of 538 watt/m^2 to 2153 watt/m^2 that sometimes can record almost 10 kW /m^2. In 2016, data centers roughly consumed around 416 terawatt hours of electricity. New research suggests that if the current trend continues, data centers would end up consuming 1/5th of overall power by 2025. This in consequence is bound to put an enormous strain on energy supplies, prompting IT businesses to incline toward green data center industry. Statistics depict, data center electricity consumption in U.S. would record nearly 140 billion kilowatt-hours per year by 2020 that is equivalent to 50 power plants’ annual output. In fact, this would emit around 100 million metric tons of carbon per year and would lead to cost Americans nearly USD 13 billion in electricity bills annually. These statistics clearly validates the massive growth prospect of U.S. green data center industry over the ensuing years, which is forecast to exceed a target revenue of USD 6 billion by 2024. It is prudent to mention that regional governmental push with regard to optimized energy utilization, has undoubtedly complemented the business growth. Say for instance, under Energy Efficient Government Technology Act that got enforced in January 2017, the U.S. government has mandated regulatory norms on agencies to develop plan that are absolutely in compliance with U.S. EPA. This has subsequently led to an increased utilization of energy-efficient technologies in data centers, which in effect has allowed U.S. to procure the maximum share of the global green data center industry in 2017. Below is an outline of exemplary innovations that have added a dynamism of sorts to the strategic landscape of green data center market. Beijing based Memblaze Technology has recently released a high performance PBlaze5 910/916 and low power 510/516 series NVMe SSD in green date center market. This upgraded version is claimed to support NVMe standard protocols with user capacity of up to 15.36TB. Endorsed with high-grade NVMe SSD features like 1 million IOPS read performance, sequential read bandwidth of 6GB/s, and read/write latency of 89/11microsecond, this PBlaze5 910/916 series is certain to create a new benchmark in the lucrative green data center market. Globally acclaimed power giant, ABB has recently made its way to the front page with the news of it powering Europe’s greenest data center in Norway. With ABB’s advanced technology, the The Lefdal Mine data center in Norway plans to develop Europe’s largest data center with minimal environmental footprint. Reportedly, ABB has provided critical power infrastructure of the plant from absolutely renewable sources- two windmills and four glacial hydropower stations, having a total generation capacity of more than 300 MW. Undoubtedly, this is being considered as one of the most appreciable projects underscoring Europe green data center market. Speaking of the competitive spectrum, companies partaking in the green data center market including Microsoft, Huawei Technologies Co. Ltd., Colocation America, Verne Global, Green House Data, and IBM Corporation have been going whole hog to bring energy-efficient solutions. In a bid to bring technologically advanced solutions onboard, product innovations via strategic alliances have emerged as one of the top-notch growth tactics. Citing a relevant instance, Green House Data recently entered into a partnership with Infront Consulting Group, a renowned IT firm with an acclaimed specialization in Microsoft applications. The deal aimed to enhance the customer portfolio for Green House Data by leveraging the technical expertise of Infront. All in all, with exponential rise in the amount of data generated and the burgeoning need for effectively tackling these data without any environmental unfeasibility, green data center market is certainly one of the most fascinating business spheres to watch unfold.